ABC News found that only approximately $25 billion is in the actual pipeline. 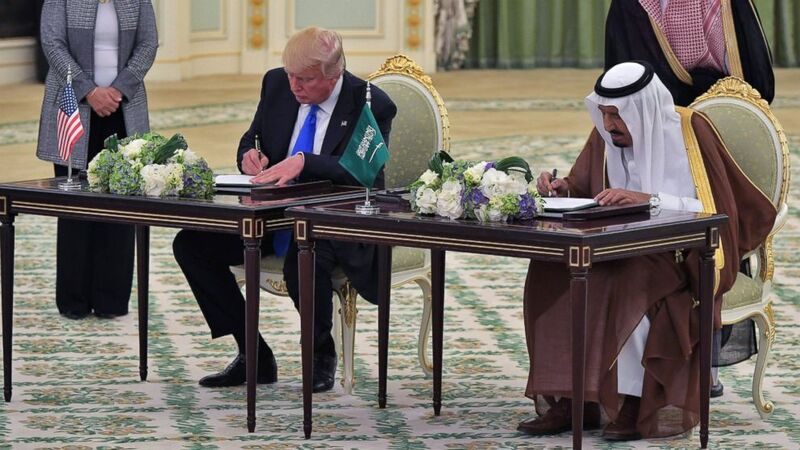 camera (Mandel Ngan/AFP/Getty Images) President Donald Trump and Saudi Arabia's King Salman bin Abdulaziz al-Saud take part in a signing ceremony at the Saudi Royal Court in Riyadh, May 20, 2017. During his first visit to a foreign nation as president, President Trump announced a massive deal: $110 billion in arms sales to Saudi Arabia. He called the agreement "tremendous" and bragged about the billions of dollars in investments and jobs that would be brought to the United States as a result. But the reality is that the U.S. is no where close to receiving that kind of money, at least right now. ABC News found only approximately $25 billion of the $110 billion in the actual pipeline, and future sales are not guaranteed. "The $110 billion deal that the president announced doesn't really exist," said Bruce Riedel, director of the Brookings Intelligence Project and a former CIA officer, who noted the discrepancy in Trump's announcement in an article Monday for Brookings, which first shed light on this aspect of the deal. In his article, Riedel wrote, "Instead, there are a bunch of letters of interest or intent, but not contracts. Many are offers that the defense industry thinks the Saudis will be interested in someday." Riedel described it to ABC News as a "wish list" of what the U.S. would like to sell Saudi Arabia in the next four to five years. But he warns that these intended sales are not contracts, and that the Saudis may be unable to pay. Declining oil prices and an expensive air campaign over Yemen means the Saudis are no longer flush with cash, Riedel told ABC News. At the time of Trump's announcement in May, the Pentagon listed six proposed sales to the Saudis that Congress had been officially notified of, required by law for Foreign Military Sales involving defense equipment. Congressional Notifications alert Congress to a "proposed" or "potential" sale and are associated with Letters of Offer and Acceptance (LOA). A LOA is a letter of interest or intent from another nation to purchase American military hardware. In total, the six possible sales are valued at about $23.7 billion. Five of the six notifications were announced during the Obama administration, some as far back as 2013. Since then, three additional Saudi-related Congressional Notifications were issued in late May and early June. These potential sales involve training and radar systems sales and total roughly $1.7 billion. All told, the approximate $25 billion in potential sales is far from Trump's claim of $110 billion. The other $85 billion would be categorized as a Memorandum of Intent (MOI), which the Pentagon's Defense Security Cooperation Agency describes as "potential future defense capabilities" for the Saudis. Under Trump’s deal, those include "border security and counterterrorism, maritime and coastal security, air force modernization, air and missile defense, and cybersecurity and communications upgrades." A U.S. official declined to comment to ABC News on the contents of the MOI, but a State Department press release shows they include the Terminal High Altitude Air Defense system (THAAD), the same missile defense system recently deployed to South Korea, as well as ships, helicopters, patrol boats, and associated weapons systems. 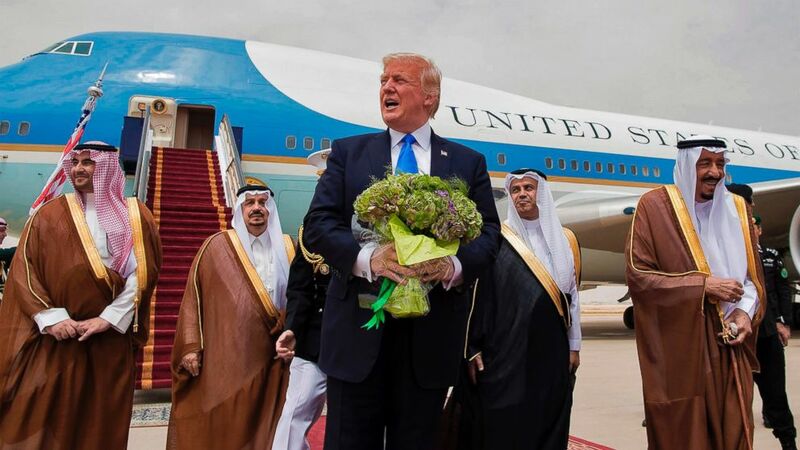 (Saudi Royal Palace/AFP/Getty Images) President Donald Trump holds a bouquet of flowers upon being welcomed by Saudi King Salman bin Abdulaziz al-Saud during his arrival at the airport in Riyadh on May 20, 2017. "The arms sale announced between the U.S. and Saudi Arabia is a broad agreement in principle," Pentagon spokesman Lt. Col. Roger Cabiness told ABC News. "It comprises multiple individual sales over several years, each of which must go through a separate procurement process. These steps include letters of intent, letters of offer, letters of approval, awarding of contract, and delivery. As the terms of these sales are finalized, we will notify Congress and make public the specifics of each transaction." Cabiness added, "We have a strong relationship with Saudi Arabia, and we look forward to continuing our partnership in promoting regional security." While one U.S. official categorized Trump's announcement as a “White House trick,” it’s hardly the first time an administration has touted an agreement that was never fulfilled. In 2013, Secretary of State John Kerry traveled to Oman, where officials signed a Memorandum of Intent to sell the Omanis a $2.1 billion arms deal, including the delivery of a THAAD missile defense system. Many parts of that deal, including THAAD, have still not been completed. One of the Saudi-related deals does appear to be on track. A proposal issued under the Obama administration that was folded into Trump's deal included four frigates that would be a version of the U.S. Navy's Littoral Combat Ship. Despite the notification reaching Congress in October 2015, just last month Lockheed Martin announced it would sell Saudi Arabia those four ships for $6 billion, part of the $25 billion identified as in the pipeline so far.